Ouch! He is believed to be only the 11th person to make this type of leap. 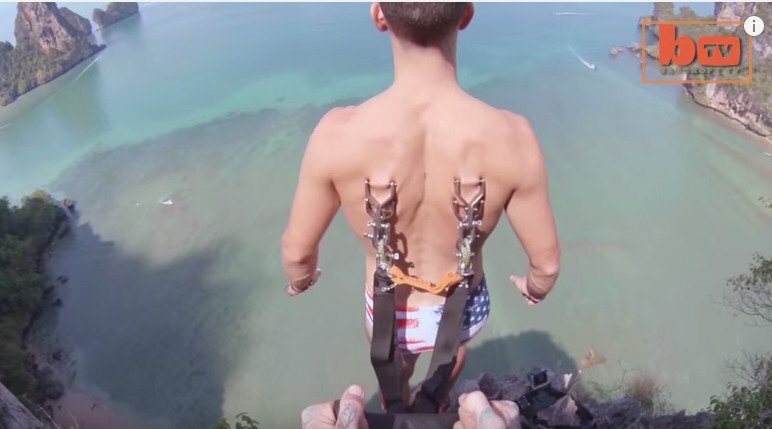 Miramant never had any other type of piercing, but for his jump from a 380-foot high cliff in Ton Sai, Thailand he had four bolts bored into his upper back. The bolts were then fastened shut and the parachute hooks were attached to the bolts. He says having those piercings “was by far the most painful part of the experience,” he told Barcroft TV. After his successful jump the grappling hooks were removed, but evidence of the strain on his flesh was obvious from the heavily-bleeding incisions. Josh says he felt no pain during the jump because any discomfort was blocked by the huge adrenalin rush. Insisting that he’s “not a masochist,” Miramant is now making plans to do it all over again later this year with a jump from a hot air balloon.